Jaseng welcomed a group of international healthcare professionals from 10 different countries on November 23rd, 2018. The meeting was arranged by Pusan National University, School of Korean Medicine, and the National Development Institute of Korean Medicine (NIKOM). The group consisted of 13 healthcare professionals including college professors, public officials and associate directors from the U.S., Germany, Australia, and Greece. 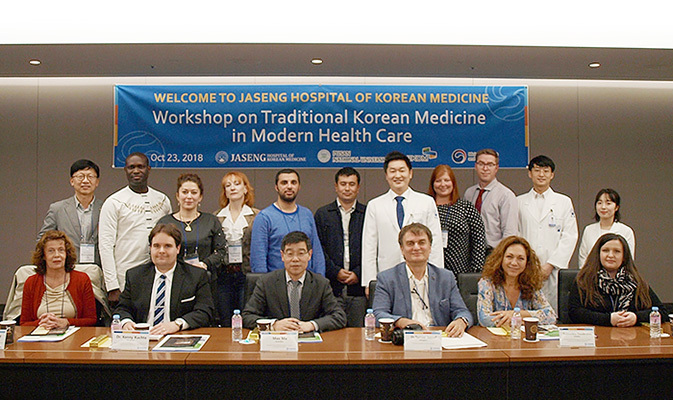 Professionals including Aaron Schindler, the President of the Minnesota Acupuncture Association and Konstantina Theodorato, the President of the Greek Acupuncture Association, visited Jaseng Hospital of Korean Medicine to learn more about Korean medicine and its noninvasive treatment methods. The visit consisted of an introduction and tour of the hospital facilities including the Korean Medicine consultation rooms, Jaseng International Clinic, and the conventional medicine Diagnostics Center. Throughout the tour, the group was able to learn in depth about the principles, efficacy, and academic achievements of Korean medicine . Moreover, they were able to experience the clinical environment and observe how various medical devices are applied in actual clinical practice at Jaseng. Specifically, the group was most interested in the fact that many musculoskeletal patients were able to reach full recovery through treatment with noninvasive, Korean medicine treatment methods. Some of the healthcare professionals were also given the opportunity to experience Jaseng treatment firsthand which covered such treatments as acupuncture, Chuna manual therapy, and cupping. Dr. Joon-Shik Shin Invited as Guest Lecturer at OMED 2018, a Renowned U.S. Medical... Everything You Need To Know About Chuna Manual Therapy!